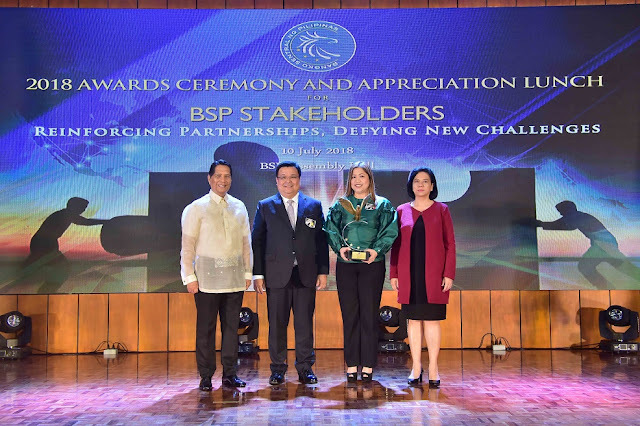 Philippine Savings Bank (PSBank) was recognized anew by the Bangko Sentral ng Pilipinas (BSP) for its excellence in responding and addressing issues or concerns of clients referred to the Bank by the BSP and was conferred the Pagtugon Award for the third time. PSBank also won the award in 2016 and 2015. The recognition was awarded to the bank at the recent 2018 Awards Ceremony and Appreciation Lunch for Stakeholders held at the BSP Assembly Hall, BSP Complex in Manila. “A proof of excellence in PSBank’s customer-centric business strategy, the recognition inspires us to further enhance our customer-relationship initiatives in line with our brand promise of delighting our customer at every encounter,” PSBank President Jose Vicente Alde said. PSBank was also recognized as a finalist in 2 categories namely Outstanding PhilpaSS Participant Servicing Customer e-Payments for Thrift Banks and Outstanding Partner for Children's Savings Mobilization.